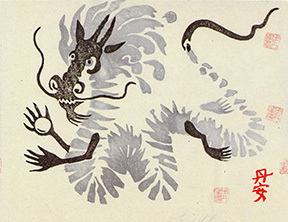 Diana Moll, acupuncturist, artist and Tai Chi instructor, celebrates the year of the Dragon with this new limited edition of 2012�s Water Dragon. We rarely sell anything but martial arts videos and books but we were so charmed by Diana�s cards we thought we�d offer them to you. Here is a pack of twelve cards (5 1/2 by 4 1/4) in glorious black and white with Diana�s own chop on the front, originally done as a Moku Hanga hand pressed print. Get in good with the dragon, order now. 12 pack: $15.95. Posted January 26, 2012 by Plum Staff. Comments and trackbacks are open. Follow the comments feed.